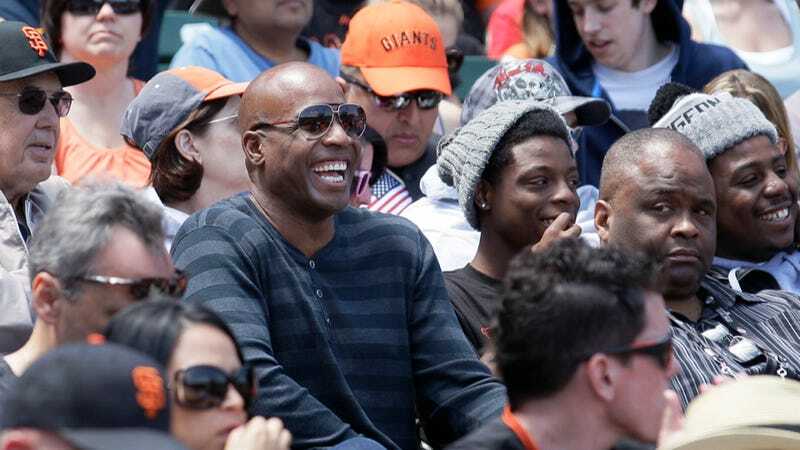 Did Barry Bonds Have A Good Time At The Giants Game Yesterday? Barry Bonds is many things. Barry Bonds is a legend. Barry Bonds is a martyr. Barry Bonds is a prick. Barry Bonds is a secret good dude. So what did we think when we saw this photo come across the Associated Press wire? We thought: this is definitive. This proves, once and for all, that Barry Bonds is a fun guy who likes to have a fun time at bad NL West baseball games on Memorial Day, games in which the Giants defeat the Diamondbacks. There was more evidence for this idea. According to the San Francisco Chronicle, Bonds "appear[ed] fit, trim and jovial." Bonds also "admitted Monday that his reputation is 'iffy' and that '[he] created that guy out there for entertainment only. Whether you hated me or liked me, you were there.'" Does this mean that Barry Bonds is not a fun guy who likes to have fun at the baseball game? Barry Bonds is a guy who talks on his cellphone at the baseball game, and that is decidedly not fun or jovial. Did the San Francisco Chronicle lie? We'll have to revisit this issue later.